I'm a follower of Jesus Christ and seek to live my life to please Him and for His glory. I'm walking this journey with my life's partner, Diann. We've been married since 1972 and have two grown children. Our daughter Julie serves as a missionary with her husband Victor in Mexico in a ministry they founded called Fishers of Men. Check their ministry out at www.fishersofmenmexico.org. Our son Dan is married to Teri and he's a detective in a police department in a suburb of Indianapolis. I have pastored the Mayfair-Plymouth Congregational Church of Toledo, Ohio since 1975, having just celebrated 33 years at the church. You can check out the church at http://www.mayfairplymouth.org/. You can also visit me at my blog, where I add material about every other day or so. I enjoy photography, that's why I'm treating you with a different photo of mine each week on the web site. Over three hundred of my photos are for sale at www.istockphoto.com. I'm also a ventriloquist, of sorts, and treat the children of my church with a "visit with Ricky" every third Sunday of the month in the morning worship services. Raising white homing pigeons is another of my hobbies. I enjoy watching them soar overhead. That's just a little bit about me. Thanks for visiting. God bless you! Kathryn is resigned to living out her last days at Victorian Manor, a beautiful old home for senior citizens. 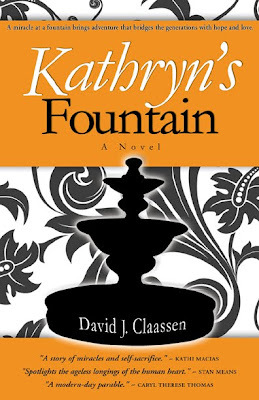 Then one day a miraculous experience happens to Kathryn at the garden fountain, and she begins living an adventure beyond her wildest dreams. Love and sacrifice take on new meaning as she involves a social worker and a police detective in carrying out what she believes to be her calling -- to rescue a street child named Jasmine. Kathryn's Fountain celebrates the gifts that the generations can bring to each other. The conclusion is a resounding affirmation that it's never too late to make a difference.